When you have a husband who works from a home office and travels, your life is a curious mix. When he's home, you know he's home. Yes, he works in his office. Often he's on the phone, and the door is closed. But he gets up early so that he can have breakfast with the girls, he takes a break so we can eat lunch as a family, and no matter how crazy he is, he can always break away for dinner and bedtime - even if that means he is back on the laptop while we're watching TV. I'm still the primary caregiver, but if there is ever a crisis - someone pooped in their bed and needs a major cleanup, someone gets hurt, whatever - he can be there for us in an instant. And even though I try not to do this often, I can run out during naptime to do a toddler unfriendly errand, where it's just quicker and easier to dash out on my own. He's still technically working, he's not taking time off to take over childcare, but he's an adult in the house while they're sleeping. When he’s not working from home, he’s completely gone. This month, Adam’s been traveling a lot – Monday to Friday. It's all mommy, all day, all the time. If there's a crisis, it's on me. If I have a toddler unfriendly errand, they're coming anyway. If I realize after bedtime that we used up all the milk, I'm not running out to grab a gallon. You know, because leaving your toddlers at home, alone, is frowned upon. Adam's been traveling for work for about 95% of the time we've been together. We had one semester together at college, and that summer he started working and being sent out to projects. Whether he's a consultant, a salesman, a project manager, or a specialist, he's always had an element of being "on the road". But because of that, I'm used to it. I don't panic when I'm the only adult at home. It didn't bother me when we were engaged, when we were married and childless, when we had one child, and now when we have two. It's part of his job, it's part of our life, and I'm very comfortable with this life. When a friend is anticipating a business trip and a few days of solo parenting, I’m often the one they turn to for advice. Somehow I’ve become the “pro” at short term solo parenting. I'm incredibly spoiled, and generally I can stay in bed until the girls get up (don't get too jealous, it's usually between 6:30 and 7). Adam will get them up and send them into our room to jump on me. When he's gone, I'm the one getting them up. I've learned the hard way that everything goes much more smoothly when I'm already out of bed before the first stirrings in their rooms. Know whatever your "tricky times" will be and prepare to handle them. f you normally have help in the mornings, spend a few minutes at night getting everything set out. If solo bath and bed is what’s scary, start the routine early so you aren’t so stressed. If your kids are anything like mine this can be a treat! This is when I’ll do breakfast for dinner or a burrito bar. Sometimes we have a picnic in the living room. We don’t often eat “kid food” for dinner, but these weeks are the perfect time to use that tool. I make meals in the slow cooker, or get casseroles ready in advance. Not worrying about cooking helps a lot when 5:00 comes. I remind myself every time that when the girls are in bed I need to carve out time to relax. Watch your favorite movie, curl up with a book, give yourself a pedicure while watching reality TV. Instead of doing chores like crazy after bedtime, I’ll let the girls watch a show while I organize the kitchen. When my husband’s off on a long trip, we’ll often do an extended play date. Instead of two hours in the morning, we’ll stay through the afternoon. We'll set up outings in the afternoons that I wouldn't normally do. I have some adult company for a while, and two moms on four kids can feel much easier than one on two. We have a deal. I take some time away, to myself, one weekend afternoon. If he’s in a period of heavy travel, I’ll take two. Recharging with some time away makes me a better mom when I’m home alone. Adam tries to call when the girls and I are eating dinner. I put the phone on speaker phone, or we’ll Skype, and he’s part of our dinner conversation. If that’s not possible, we find another time. We stay connected, and the girls understand where he is and what he’s doing. 8) Relax. You can do this. If this isn't something you do often, you might want to panic about all the "what-ifs". Don't. Don’t line up babysitters and family. Give yourself a chance to succeed. I’ve done this with a newborn who was waking up multiple times a night and a toddler, a teething baby and a two year old, and two feisty toddlers. We always survive – and thrive. To some, it may sound tough and overwhelming, but I don’t know life any other way. 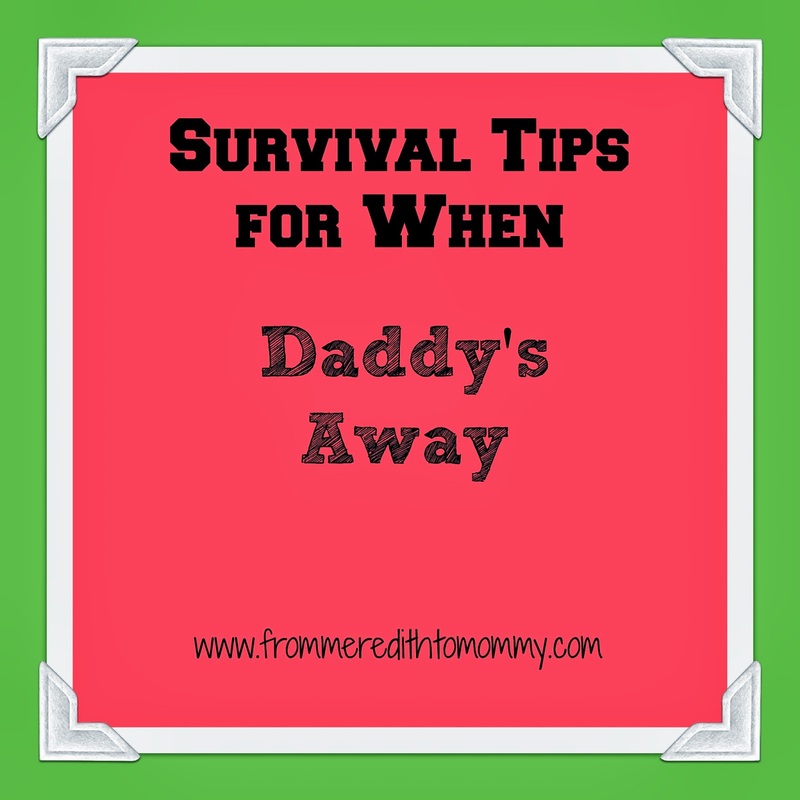 When I compare our life to a military family, we have it easy. When I compare life to someone where the dad is working two back to back shifts, we have it easy. When Daddy's away...we still love to play!